Take a Magic Carpet ride through a forgotten world. Click here to play! This exciting slot machine will have you hearkening back to the classics, as well as winning incredible cash jackpots. 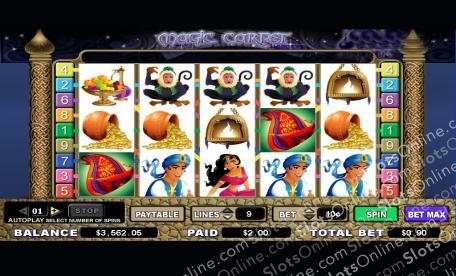 Magic Carpet is an entertaining 5-reel slot that is played across 9 unique pay lines. Open up more lines, and you’ll be rewarded with more opportunities for creating combos. The Genie is Wild and, while it doesn’t payout on its own, it can be subbed into any winning combination in order to win cash. The Magic Carpet is Scattered and will not only earn you up to 150 coins on the best spin, but will also trigger Free Spins when three or more appear at once. Gold, Fruit, and Monkeys will all help you earn big payouts, but for the best combo, land five Princes on an active payline for 4,000 times your original bet. Start winning on this Magic Carpet tonight! The Magic Carpet is Scattered and can not only pay out whenever two or more appear, but can show up anywhere on the reels. Land three or more to earn exciting Free Spins. Genie can appear on reels 2, 3, and 4, and can become any other symbol in the game except for Scatters. Cryptologic also gives you the ability to stop your auto spins when a jackpot is won, a single win exceeds a dollar amount, any win, an increase or decrease by a predefined amount or simply, when the number of spins are complete.